IASUS – a company that you should not confuse with Asus of Taiwan (strange how adding an ‘i’ prefix changes everything and yet makes things feel so familiar) has just announced that they have a headset solution for those who want to hold smartphone conferences, relying on a design that is inspired by Secret Service headsets. Known as the 500K, this is touted to be the ultimate conference call headset – but will it be able to live up to its billing? We won’t really know unless we take the 500K Headset out for a spin, as it delivers ultimate comfort, clarity, and reliability, while setting a new performance standard for mobile headset communication. After all, today’s business professionals tend to live an extremely connected life – where hours on end can be spent on conference calls as well as VoIP web conferences. These communications power users will certainly be less efficient with conventional headsets, as those tend to result in discomfort, pain, and mechanical overheating in the ear. 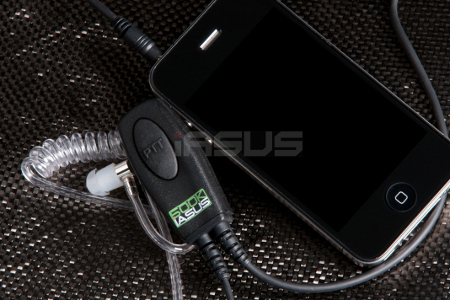 As for wireless headsets, those tend to suffer from dropped signals and a short battery life. Good thing IASUS intends to show the world just what they can do with the 500K, where it has certainly gone through a whole lot of thoughtful design and engineering before rolling off the production line. The 500K Acoustic Coil is in reality, a unique earpiece that has been adapted from the design of standard-issue Secret Service headsets. This is a lightweight acoustic coil that will rest securely and comfortably in the ear without causing any occluding to the ear canal, hence allowing one to wear the headset all day long sans feeling of discomfort and overheating. Not only that, IASUS has also thrown in a noise-reducing unidirectional microphone that has been housed within the 500K’s answer/end call button for uncompromised clarity. It features durable cables and a military-spec answer button to ensure that with the 500K Headset, you will never fail to connect to your incoming calls and web conferences. You can use the 500K Headset with computers as well as most cell phones on the market, where each $99 purchase will need no installation, charging, pairing, or assembly and will be accompanied by a 2-year manufacturer’s warranty.